Capt. Herbert Davy Longe was born in Devon in 1862. He went on to serve in Mashonaland and Matabeleland in Zimbabwe for the British run government service. He was a Captain in the British South African Police and later a Captain in the Territorial Force Reserve and The Royal Defence Corps during WWI. In 1903 he bought Abbot’s Hall. He farmed the estate up until his death in 1949 when it passed to his two daughters, Vera and Ena Longe. Capt. Longe owned Abbot’s Hall’s estate of 89 acres and Combs Lane Farm with 114 acres. He bred and exhibited Silver laced Wyandotte Chickens up until 1926 when Ena took over the management of the flock. Abbot’s Hall Farm also bred Red Poll cows and Suffolk Punch horses. The herd of cows produced enough milk for the estate and for the surplus to be sold on a milk round around Stowmarket town centre. 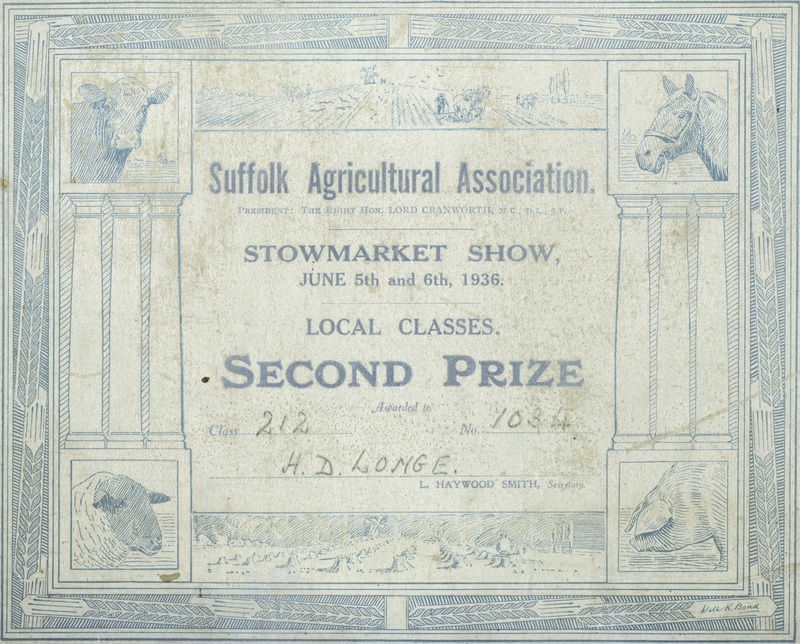 This certificate is one of many Longe won entering his Red Poll herd into competitions.